Inspirational art classes for creative young minds. At Quirky Cactus, the individuality and creativity of every child is captured within unique and quirky pieces of art reflecting their own personal style. The finished pieces are something that you and your little artists will be proud to display in your home. A well-known artist or a particular style of art is the inspiration for each lesson at Quirky Cactus. Some of the influential artists I use for inspiration within my lessons include Anya Brock, Grotti Lotti and Rebecca Cool just to name a few- please click on the links to see some of their work and to find out more about these Australian artists. Within each lesson, students observe art and discuss the features, talking about the colours used, the shapes, lines, textures and anything they particularly like or dislike about the piece. With guidance, students work on creating their own masterpiece, inspired by the focus artist or particular style of art. Students are not copying the work by the artist, they are using it as inspiration to hopefully create something quite different, reflecting their own personal style and individuality. Different mediums are used, depending on the style of art, including; bright ink, watercolour paint, acrylic paint, markers, paint pens, handcrafted paper for collage, watercolour pencils, crayons, oil pastels and chalk pastels. Classes are suitable for 6-16 year olds. Parents/Caregivers of children may not stay during the lesson. This is in the best interests of the child and the class. Classes will be held at the Subiaco Arts Centre, which is located on 180 Hamersley road in Subiaco. Class sizes are relatively small, ranging from 5-20 students to allow more one on one time. The studio space is large with plenty of room for students to find a comfortable working space. Street parking is available with a one-hour limit. Art is important for the development of fine motor skills and it can help to boost self-confidence. It helps children to use their senses, express emotion and develop their creative side . I am a primary school teacher and a primary visual art specialist with over eight years teaching experience. I was teaching in a country town in the north of Western Australia and after several years of classroom teaching, I was lucky enough to have the opportunity to teach visual art. I realised how much I love teaching art, and I found that the students in my class were equally excited about creating beautiful masterpieces that expressed their own unique style. 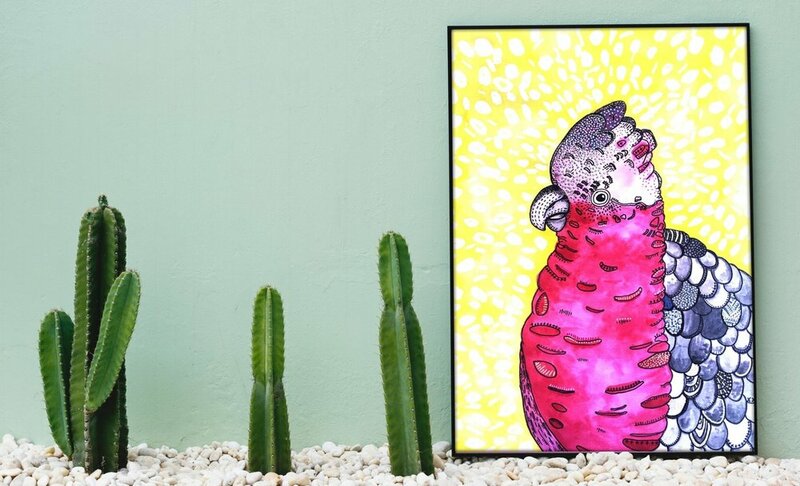 Because I have such a passion for art, I decided to bring Quirky Cactus to life to give students the opportunity to discover their own love of the arts and develop a lifelong journey within the arts. Some of my inspirations include Frida Kahlo, Wassily Kandinsky, Vincent Van Gogh and Pablo Picasso, as well as many modern artists, including Anya Brock, Rebecca Cool and Grotti Lotti. My inspiration mostly comes from those artists who use bright, bold colours and mixed media within their pieces, such as ink, paint, markers, paint pens and collage. Thank you, I’ll be in contact as soon as I can!